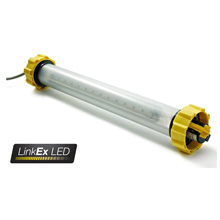 THE LINKEX™ LED TEMPORARY LUMINAIRE IS A HIGH POWER LED LEADLAMP FOR USE IN SHORT-TERM LIGHTING INSTALLATIONS AND MAINTENANCE TASKS AND IS CE MARKED TO THE ATEX DIRECTIVE AND IECEX CERTIFIED FOR SAFE USE IN ZONES 1 AND 2 POTENTIALLY EXPLOSIVE GAS AND DUST ATMOSPHERES, WHERE A T3 TEMPERATURE CLASS PERMITS. Providing high quality ambient lighting, each unit utilises two arrays of high power LEDs offering brilliant white light output, high reliability, low maintenance ‘fitted for life’ light source, and power savings allowing longer cable runs and more lights powered from a single supply. Luminaires are supplied in ‘180°’ format (arrays side-by-side) to give effective unidirectional illumination or in ‘360°’ format (arrays back-to-back), to special order, to give effective omni-directional ‘all round’ illumination. 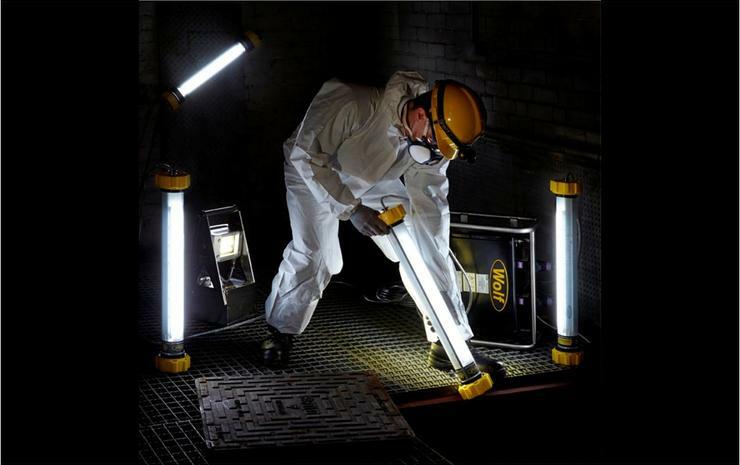 The unit’s construction is lightweight, compact and highly robust, with impact resistant end caps and tube (with anti-static and light diffusing coatings) plus the high visibility shock absorbing bump rings are chemical resistant and minimise the risk of drop damage, all ideal for handling in demanding conditions. Units can be fitted with integral ATEX sockets allowing multiple lamps to be quickly and safely connected and positioned in a chain whilst energised. Available in two voltage input ranges: high voltage 85-264V AC for general applications and low voltage 19-28V AC/DC for use in confined space applications, such as metal tanks, with a higher risk of electric shock. The wide input voltage ranges maximise usability and safety for chains of multiple lights or for long cable runs, where supply voltage can drop. For added confidence, it incorporates a SOVI (Safe Operation Voltage Indicator) monitor showing when voltage is safe (within) or unsafe (outside of limits). *Lamps fitted with Stahl sockets are IP54.